Improving upon the nation's favourite trainer was never going to be an easy challenge. 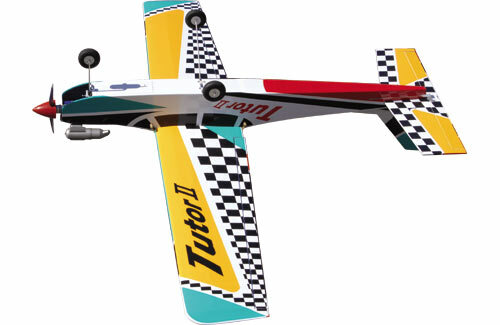 But the all-new Tutor II succesfully combines all the features that made it No.1, with further refinements that encompass the latest improvements in model flight technology. It includes a specially developed tapered wing for improved aileron response with a more predictable 'feel' and cleverly designed tail surfaces that make spin recovery a breeze. 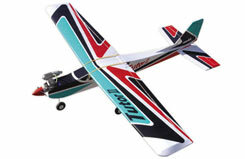 The Tutor II has an easy access battery hatch and custom hardware that make it as simple to assemble and fly with either electric motors or glow power sources. Incorporating a fresh 'dynamic' colour scheme that makes it even easier to track in the air, we're confident that the second generation Tutor will soon become as highly regarded by flying schools, club instructors, and novice pilots as the original design classic. Like it's predecessor, the Tutor II has a fully illustrated colour instruction manual that is simple for the learner to follow and ensures success first time. In fact, the instruction manual of the Tutor set the industry standard for trainer manuals and the Tutor II maintains that tradition.